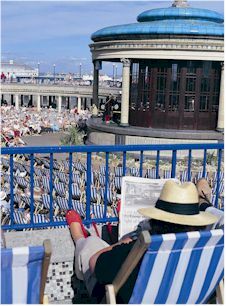 Eastbourne's first bandstand was built in 1893 and a Municipal Orchestra was formed in 1899. There is a commemorative plaque at the rear of the current Bandstand in memory of Eastbourne bandsman John Wesley Wooward who was one of those playing on the Titanic when it sank on April 15 1912. The current Bandstand was built in 1931 and cost £10,000. It is one of the most distinctive sights in Eastbourne with its blue dome and golden finial. In recent years the Bandstand has been filmed for the National Lottery's 'Winsday' television commercial and for pop music promotions for Blur and Del Amitri. Eastbourne Bandstand's Military Band Season features top military bands such as The Band of the Army Air Corps, the Central Band of the Royal British Legion and the Band of the Royal Engineers. The Military Band Season runs through July and August. The full concert season runs from the beginning of May to the end of September with performances including the Eastbourne Silver Band and Sussex Brass. http://worldmilbands.ottawa.com - information about military bands around the world, including most that perform at Eastbourne's Bandstand. www.army.mod.uk - the official Army web site with information about Army bands. www.britishlegion.org.uk - the official British Legion site. The Bandstand is situated on the seafront off Grand Parade, opposite the Cavendish and Albany Hotels. Free car parking along the seafront or, when full, pay and display in Devonshire Place. Copyright © 1998 by Eastbourne.org Limited. All rights reserved. Revised: 12 Oct 2000 16:02:35 GMT Daylight Time.